Branson Ticket & Travel - Branson’s White Water presents its most rockin’ season ever, with new events including concerts and dance parties, “dive-in” movies on a giant screen above the wave pool, and an expanded calendar with more days for fun in the sun, plus more nights during Night Water. Expanded picnic areas and additional umbrellas offer more areas to relax poolside, and a special new benefit is added for season pass holders: admission 10 minutes before park opening to select their favorite beach spots. Open May 18 – September 2, White Water features 13 acres of tropical attractions, more than a dozen rides and attractions and two million gallons of cool, water fun. 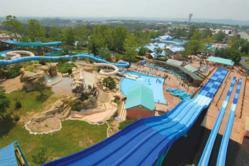 Click Here to get two days at White Water for the price of 1. Concerts and dance parties are planned for select dates throughout the season. A new, 10-foot screen above the 500,000-gallon Surf’s Up Wave Pool displays the “countdown to waves” and then shows “dive-in” movies Thursday nights during Night Water. A popular nighttime event, Night Water returns Thursdays through Saturdays July 4 – August 10, plus Saturdays August 17-31. From 10 a.m. until 10 p.m., guests can play all day and into the night, surfing the wave pool at dusk, floating Aloha River under the stars, or racing down the speed slides in the dark. Night Water evenings are offered August 23 & 30 from 5 – 10 p.m.
Water rides range from mild to wild. For the thrill seekers, Kalani Towers is a 7-story, 6-slide, multi-experience thrill ride, with two 300-foot drop slides for free-fall body sliding and four additional 312-foot slides for lane racing. For the more relaxed adventurer, Aloha River is an 800-foot plus river, where tube riders cast off and float in a setting of lush Polynesian jungles, with twists and turns, water features, fountains, misters, geysers and more. Additional attractions range from the double speed slide Raging River Rapids to the 4-person raft ride Ohana Falls. Splashaway Cay is an interactive family attraction with slides and geysers, and Coconut Cove is a play area specially designed for smaller kids. Also new this year are Birthday Party Packages and Junior Life Guard classes, offered in June. White Water is open May 18-19, then daily May 25 - August 11, and on select days August 13 - September 2. For more information: 1-800-432-4202 or Click Here to request more information.